I've been sewing a lot lately. Painfully obvious, I know... While sewing, I often think about the joy on Indigo's face when she sees something I've made for her. I've thought about how I have made her several dresses... and how there are little girls who would long for just one dress... little girls who live in tattered rags. Right or wrong, what we wear affects how we feel about ourselves. Most of us wouldn't go out wearing clothes that were falling apart, not only because of the way we would be perceived by others, but also because of the way it would make us feel about ourselves. Our mission is to provide relief to children of Central Africa. One of the ways that the mission is accomplished is by distributing little dresses to the orphan girls in the remote villages of Malawi. Because of the widespread AIDS pandemic, little girls are often left to be the primary care givers of their young siblings. It is our hope that in delivering dresses to these young girls, that a seed will be planted in the name of Jesus in their hearts that they are worthy. Along with being something that they all need, distributing the little dresses gives us an opportunity to hold camps and informal teaching sessions to increase their knowledge in stopping the spread of the dreaded AIDS disease and promote good nutrition, health and family skills knowledge. 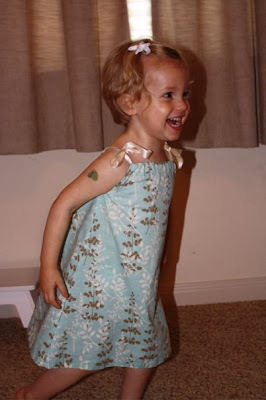 The first dress I made for Indigo was a pillowcase dress. It is a very simple way to begin sewing for those of you who might be interested in sewing. Not interested in sewing but still want to help? Awesome! You can send pillowcases to Little Dresses for Africa. Or, if you would like, you can send them to me and I will sew them and take a picture so you can see the difference YOU made by donating a pillowcase. If you are interested in this, email me at ourtaiwaneseadoption@gmail.com You could also donate supplies or make a donation to this organization. Little Dresses for Africa is expanding their outreach not only to Malawi but also Ethiopia and Kenya is well. Edited to add: okay, i did it! here's my first dress. i made one to fit a two or three year old. The founder of Little Dresses for Africa told me that the little girls love pockets and anything else i wanted to add. i hope some little girl loves it! What a lovely idea! One of these days I'm going to try my hand at a little dress! Love it - maybe this would be a great, purposeful project for my girls! Thanks for sharing. @ emily: you most definitely should. soooo easy. @ joy: i think it would be a GREAT project for your girls! keep me posted! What an awesome organization! I never really wanted a sewing machine unti I started reading your blog, now I do more and more. :) I will look for some cute pillowcases next time I'm out! And the dress you made, adorable. I love the pockets! That's it. I've had it. I'm getting my sewing machine back from my sister. It is time to stitch again. You are my inspiration. Thanks! This look seasy enough for my duaghter to help with as well! She has been wanting to sew and I haven't really found anything that she could really help with that would be meaningful. Do you know of a pattern on line or do you have directions you could email or post on your blog for the pillowcase dress? Thank! I just mailed out 35 dresses last week- they whip up quick!! what a great organization!! !